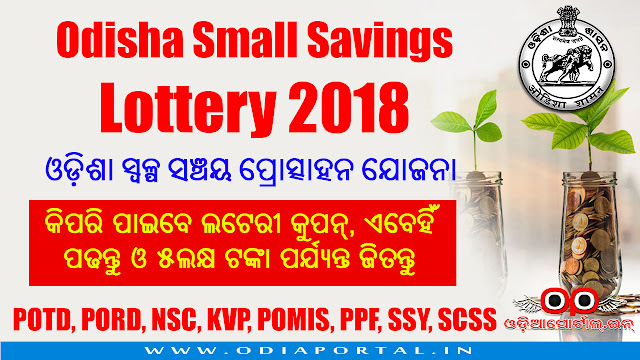 Issue of free incentive coupon has been started under Odisha Small Savings Incentive Scheme “AO” Series for the calendar year 2018 from 01.10.2018. The issue of coupons will end on 28th of February 2019. Hurry and collect your coupons as soon as possible. Period of the scheme-01.01.2018 to 31.12.2018. Deposits should be made in any Post Office or authorized Bank situated within the State of Odisha only. SCSS deposits made in Banks should be under Govt. of India Small Savings Scheme. “AO” series web based coupons are available in Office of the Collectors, Sub-Collectors and BDOs. There are 2425 nos. of prizes in 07 categories. First prize is Rs. 5,00,000/- and the 7th prize is worth Rs. 2,000/- each. If you have any deposits under above schemes (POTD, PORD, NSC, KVP, POMIS, PPF, SSY, SCSS), you can visit Office of the Collectors, Sub-Collectors and BDOs before 28th February, 2018 with valid documents and Scheme Book/Documents to collect your coupons for free. sir,what about the result of AO series...It was drawn on 29th Apr ..but yet we can get nothing about the result..
Is AO series lottery, 2018 result published. I am not able to find result in your site. ପୋଷ୍ଟ ଅଫିସ ଛାଡି ଅନ୍ୟ କୌଣସି ବ୍ୟାଙ୍କ ରେ ppf ଆକାଉଣ୍ଟ ଖୋଲିଲେ ସ୍ୱଳ୍ପ ସଞ୍ଚୟ ଯୋଜନାର କୂପନ ମିଳିପାରିବ ନା କେବଳ ପୋଷ୍ଟ ଅଫିସରେ? Good day. How can I know about my lottery result.